I totally forget her facial markings. YAY GOOD JOB ME. But besides that, I'm really pleased with the way it turned out! Something about her face in this picture really makes me think of Lirin...but less hyper and happy, obviously. XD I want to give her a hug! :D I'm glad. I think they're more suited to her eyes. Also, note on Indian-wear. Globalization is such that no one actually wears traditionally iconic Indian clothing -- except in certain circumstances like traditional dance or ceremony. Older generations of Indians living in the US or UK (essentially, not in India), are the ones who will wear traditional clothes. It might not let you through the facebook filter but here. On the right is Shaun from Dubai I believe. English is not his first language, but there is nothing 'Indian' about what he wears (especially not the text :P). So most foreign cultures are portrayed to be exotic in media, but globalization has done its work. 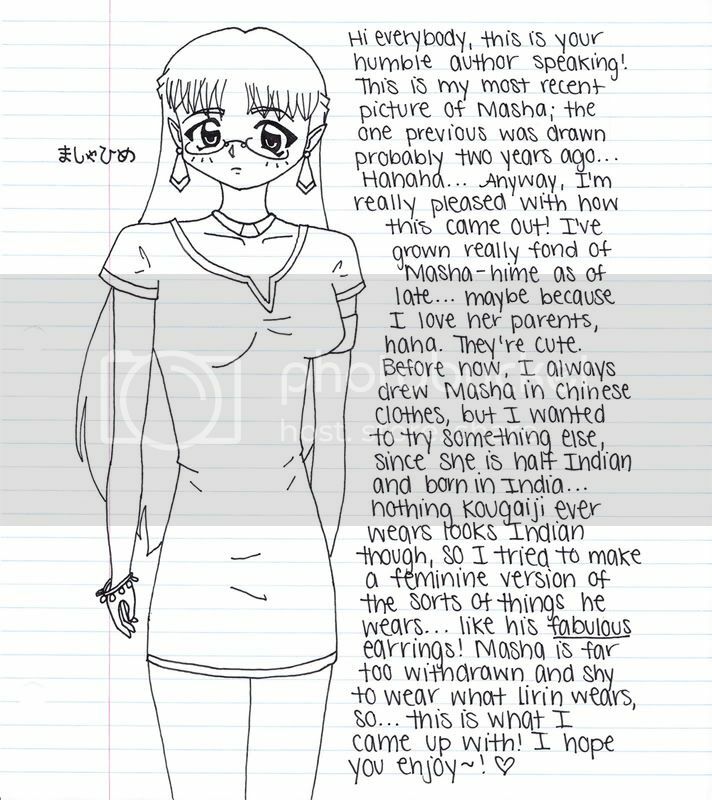 ... as interesting as that all is, considering the drawing is for a fantasy world in which there is a country called "India" which, so far, has shown no real similarities to the actual country of India besides geographical location, I wasn't really going for anything really Indian. Not to mention, as it were, if the India in the Saiyuki universe were parallel to the real India, it would not be equivalent to modern day India, but India in the early 600s CE, since that is the time period in which Minekura's Saiyuki is set. I am, indeed, aware of the fact that people residing in India currently don't, for the most part, walk around in traditional Indian clothing, and, believe it or not, I have heard of globalization. But thanks anyway.